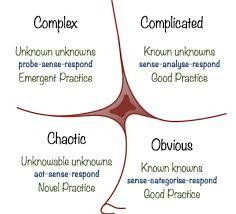 The Cynefin framework is one of the leading sense-making tools for Management, built a foundation of complex adaptive systems theory. It provides a pragmatic means to recognise that different types of system require different leadership strategies. It is extensively used in the AGILE, LEAN and KANBAN communities and provides a means to bridge the gap between IT and both strategic and operational leadership. This one day seminar provides an opportunity to spend time with the originator of the Cynefin framework and gain an overview of the various methods and models used. It requires no previous experience but some basic reading will be provided in advance. At the end of the seminar participants will understand how to use the Cynefin framework, its relationship to other methodologies and practices and how to integrate its IT use with wider strategic and operational needs in the organisation. It is geared towards people in IT Leadership positions and those who advise them.